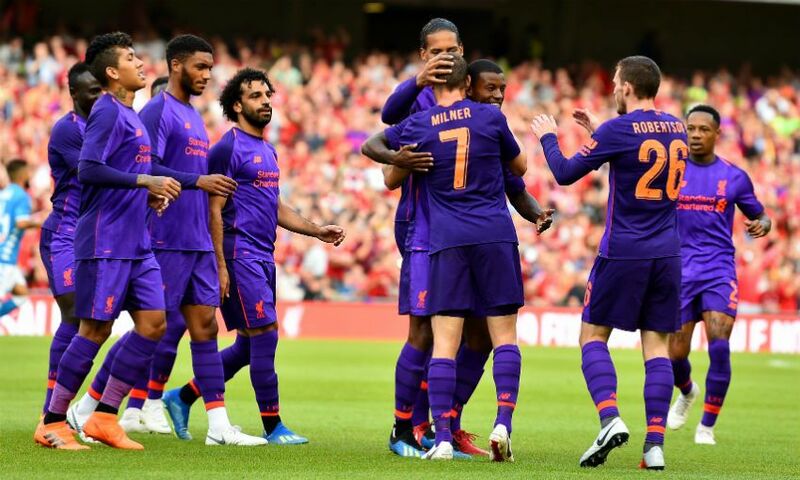 Liverpool produced a superb display to defeat Napoli 5-0 in Dublin in their penultimate pre-season friendly on Saturday evening. Goals from James Milner and Georginio Wijnaldum put the Reds - for whom Alisson Becker debuted in goal - two goals to the good inside the opening 10 minutes at the Aviva Stadium. And clinical second-half strikes from Mohamed Salah and substitute duo Daniel Sturridge and Alberto Moreno ensured Jürgen Klopp’s side’s dominance of proceedings was reflected accurately on the scoreboard. A meeting with Torino at Anfield on Tuesday is Liverpool’s last friendly assignment before their Premier League campaign begins at home to West Ham United next Sunday. As well as handing Alisson his Liverpool debut, Klopp opted to start Roberto Firmino after the Brazilian duo reported for pre-season training earlier in the week. Naby Keita also returned to the starting XI after recovering from a stiff neck, while Trent Alexander-Arnold was included among the substitutes after he joined up with the squad in Evian on Tuesday. Ragnar Klavan, Adam Lallana, Joel Matip, Marko Grujic and Danny Ings all missed out. The Reds signalled their attacking intent from the first whistle and their early pressure was rewarded in the fourth minute, when Milner arrowed a left-footed drive into the top corner from Sadio Mane’s pull-back. Mane could have got himself on the scoresheet soon after as he sought to apply the finishing touch to a slick move started by Firmino and Salah, only for Raul Albiol to block his attempt. Liverpool, though, did not have to wait long for their second goal of the evening as Milner turned provider with a superb inswinging cross from the left that Wijnaldum nodded home. After coming under siege in the early stages, Napoli grew into the contest and Arkadiusz Milik fired narrowly wide after displaying quick feet in the area midway through the half. Alisson then produced his first save in a Liverpool shirt, the Brazilian getting across sharply to palm Lorenzo Insigne’s clever, curling strike wide. The Reds quickly reasserted their authority and had the ball in the net again around the half-hour mark, only for the assistant referee to rule Firmino’s close-range finish out for offside after Wijnaldum had sprung Salah in behind Napoli’s backline. There was a disallowed goal at the other end before the interval, too, with the flag cancelling out Jose Callejon’s strike. Mane whistled a shot just wide soon after the restart but, with 58 minutes on the clock, Liverpool had their third. Xherdan Shaqiri, who came on for Firmino at half-time, was heavily involved as he latched onto Mane’s pass and stood a cross up towards Salah, who found a pocket of space in the box and sent an unstoppable curler beyond Orestis Karnezis. That was the No.11’s final involvement as Klopp made five changes on the hour, with Alexander-Arnold among those to be introduced for his first appearance of pre-season - this after a clash of heads with Mario Rui meant Milner had to be replaced by Fabinho. Karnezis got down well to deny Sturridge after he’d broken clear and shot low across the Napoli goalkeeper, and the substitute striker then went close with a classy dink after being fed by Curtis Jones. Sturridge wasn’t to be denied his goal, however, and he duly stroked home the rebound after Divock Origi’s attempt had been stopped by Karnezis with 17 minutes left on the clock. And there was still time for one more, as Moreno slammed a powerful shot into the roof of the net from an acute angle.